I’ve wanted to make a Santa Fe heavyweight passenger train for some time so I’ve been slowly acquiring cars, parts and research material. I decided to model the California Limited as it was in 1939 arriving/departing Los Angeles. Once a “name train,” it was relegated to lower status by the famous Super Chief. 1938 California Limited. Detail of Santa Fe photo from the William K. Barham Collection, courtesy of the Pacific Railroad Society. Published on Pp. 22-23 of Dining and Beverage Service Cars of the Santa Fe, SFRH&MS. The consists of the Chicago-Los Angeles train varied as cars were dropped and added at various points. 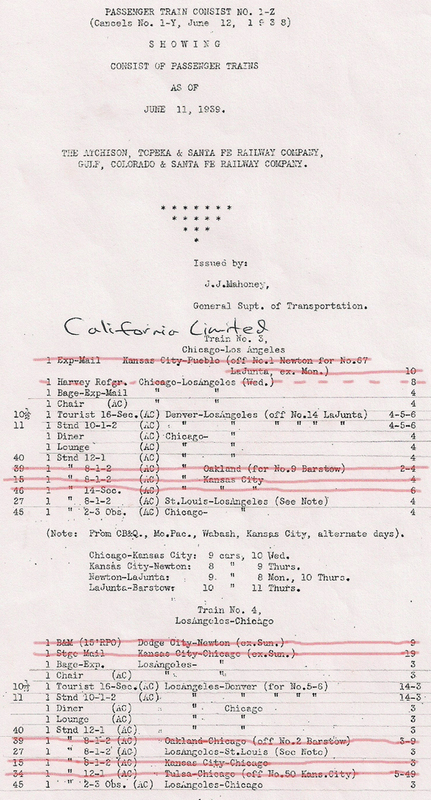 The train was so popular that it often ran with multiple sections so it is entirely possible that a train with just about any car similar to those listed on the June 11, 1939 consist list 1-Z, shown above, would be correct. Click on the image to make it large enough to read. The red lines indicate cars not going to/from Los Angeles. See the Santa Fe California Limited brochure, dated Dec. 15, 1939 here. At the top of the page are links to the various cars in the consist. These show my reference information and progress in model building. As you can see there are still questions and blank spaces. If you can help with corrections, information or reference material, please add a comment. As I discover information and work on the models this information changes without notice to reflect the latest developments. Walthers did most of the work on this ready-to-run authentic Santa Fe chair car. Go to the chair car page to see some simple additions that added realism. To make a credible-looking train at public shows, I’ve added details to the Pullman Observation car. I’ve removed the interior walls and details from a compartment, a drawing room and two bathrooms to make space to hide an AA lithium battery. It has a slide switch controlled from under the car to light the marker lamps and California Limited tailsign. A Walthers 933-1088 interior lighting system, powered from the track, has been modified to move one of the lights from the center of the car to the observation lounge area. When running on DC power, the lights are dependent on the operating voltage but when running on DCC they’ll have a constant voltage for better appearance. Steam ejector air conditioning parts from a chair car were added to the roof. Passenger figures enliven the interior and platform. Decals for the car name and “WATCH YOUR STEP” signs on the steps were added. Detail painting included applying metallic bronze on the rear railing — however it’s not clear if Pullman cars had that fancy touch. See the Pullman Observation car link for construction details. I finally got the loco running well (scroll to the bottom of the Locomotive and Tender page to learn how. The decals on the baggage-express car didn’t look readable enough so I applied a second set on top of the first. That solved the problem. It could still use a little more clear gloss paint and polishing to minimize the decal thickness. I’ve added a few figures to the Walthers coach and Pullman cars. They still need to have details and name/number decals added — as well as some lighting put in, too. Next up will be replacing the various Kadee #5 and Walthers R-T-R couplers with Kadee #118 “SF” shelf head metal whisker couplers. After adding details to the other R-T-R cars, the next new car to build will be the diner. I’ll start with the Lambert brass car. I had bought the Suydam RR-3 shell from the original production but last year I acquired a later one that has a brass frame/floor with what appears to be Central Valley trucks. After the diner, I’ll build a lounge using Lambert brass #8300. See the Dining Car and Lounge pages for details and construction progress. Detail painting, diaphragms and very light weathering make this about as done as it’s going to be. There are some shortcomings that might be addressed later, such as adding steps under the side doors. It’s time to call this one “done” and move on. It started as an unpainted Suydam brass shell. To see information about my building it click on the “HEAD END CARS” link at the top of the page. Brass engine + DCC + paint in one month? May 2015: Not in my expected one month time frame but, after five months, it’s done! Starting with an unpainted Sunset ATSF 3700 class brass engine I made functional and cosmetic modifications then painted and weathered it. See the the Locomotive and Tender page at https://steamblog.wordpress.com/locomotive-and-tender/ for details. Now I’ve got to get the baggage-express and passenger cars on the rails. To see how they’re coming, choose from the subjects at the top of the page. Santa Fe Coach Green is different from Pullman Green. As with just about anything related to colors in model railroading, getting the right shade involves many variables and opinions. Updated May 2015: After much experimenting — and painting/stripping the baggage-express three times, I’m using the following colors for Santa Fe heavyweight cars. 2 parts Polly Scale Pullman Green + 4 parts Polly Scale GN Empire Green + 1 part Polly Scale Reefer Yellow, thinned with distilled water. Airbrushed with Badger 150 using a III needle and head at 15 psi. When dry, sprayed with Testors One Coat Lacquer clear gloss from spray can to provide a gloss finish for decals. After decals, several coats of Testors One Coat Lacquer clear gloss from spray can. One coat of Testors Model Master 1959 Semi-Gloss clear from spray can. B. Roof: Rustoleum 2089 Dark Gray Primer from spray can. Floquil Rail Brown from spray can. Polly Scale: GN Empire Green. I painted the trucks on my baggage-express with this then sprayed on two coats of clear (Pledge/Future) and it looks good. E. Interior: To be determined, probably will vary by car.